Start with the basics. (Presumably the least pretentious place to begin.) The Latin prae — ‘before’ — and tendere, meaning ‘to stretch’ or ‘extend’, give us the word ‘pretentious’. Think of it as holding something in front of you, like actors wearing masks in the ancient Greek theatre. In politics the claimant to a throne or similar rank was known as a ‘pretender’. Upheavals in England, Scotland and Ireland brought about by the ‘Glorious Revolution’ in 1688, for example, saw the overthrow of the last Stuart king, the Catholic James II, by the Protestants William and Mary. Two ‘pretenders’ aiming to restore the Jacobite monarchy subsequently made claims to the English crown. (The most famous of these was the ‘Young Pretender’, Charles Edward Stuart, also nicknamed Bonnie Prince Charlie.) To be called a ‘pretender’ was not necessarily an insult; the issue was the legitimacy of the claim you held before you, prae tendere. Authority was recognized on the basis of your political allegiance and religious belief, not questions of truth or falsity. This pretence was not an act. It was a matter of blood and God. Go back to the actor and the mask. In classical Greek theatre the word hypokrités — from which we get ‘hypocrisy’ — was the standard term for actors, deriving from the words hypó (‘under’) and krisis (‘decide’, ‘distinguish’ or ‘judge’). It was a way of describing a dissembler, the faces of the mask and the actor beneath it. When St Paul, in his Epistle to the Romans, wrote ‘Let love be not hypocritical’, he used the word in this Greek sense, meaning ‘actor’. Paul meant that love should not hide itself behind a mask representing love, or use words signalling it insincerely. ‘Man is least himself when he talks in his own person,’ said Oscar Wilde. ‘Give him a mask and he will tell you the truth.’ Well, maybe. It depends on the time and place. Theatre, cinema and broadcasting provide the professional licence to wear one. We derive pleasure from the deceits of the stage illusionist, whose acts of fakery we pay money to watch. (Magician James ‘The Amazing’ Randi describes himself as ‘an honest liar’.) In carnival and ritual too, the mask is socially sanctioned. Outside these fields the actor’s mask is suspect. So we smear it with the brush of immaturity, dismissing it as ‘pretending’. Pretending is what kids do to figure out the world. Children do not put on airs. A child might be precocious — from the Latin prae, meaning ‘before’, and coquere, ‘to cook’, that is, pre-cooked or ripened early — but it’s rare that a child is called pretentious. That insult is reserved for their pushy parents; pretending is what’s done at the kids’ table, pretension goes on over the wine and cheese course with the grown-ups. Pretending reminds adults of childish things long put away; of imaginary friends, of the companionship found in favourite teddy bears and dolls, in toys we imagined to have distinct personalities, and the stories we swaddled them in. To pretend is to live in denial of ‘real’, grown-up problems. It’s child’s play. And a play is also what professional actors are employed to make onstage in theatres. ‘Acting is a reflex, a mechanism for development and survival,’ writes theatre director Declan Donnellan in The Actor and the Target. ‘It is not “second nature”, it is “first nature” and so cannot be taught like chemistry or scuba diving.’ Acting is a tool of every social interaction we have from birth. ‘Peek-a-boo,’ says Donnellan, is the first play a baby enjoys, when its mother acts out appearing and disappearing behind a pillow. “Now you see me; now you don’t!” The baby gurgles away, learning that this most painful event, separation from the mother, might be prepared for and dealt with comically, theatrically. The baby learns to laugh at an appalling separation, because it isn’t real. Mummy reappears and laughs — this time, at least. After a while the child will learn to be the performer, with the parent as audience, playing peek-a-boo behind the sofa … Eating, walking, talking, all are developed by observation, performance and applause. We develop our sense of self by practising roles we see our parents play and expand our identities further by copying characters we see played by elder brothers, sisters, friends, rivals, teachers, enemies or heroes. ‘Born Originals, how comes it to pass that we die Copies?’ asked Edward Young in his Conjectures on Original Composition. Young would argue that mimicry blots out individuality. But mimicry is a mechanism by which we become socialized, by which we make ourselves human. It doesn’t take a sociology Ph.D. to recognize that we pretend every day. Pretend to be absorbed in a book to avoid catching the eye of a stranger on the bus. Pretend to be pleased to see your boss when you arrive at the office. Putting on a suit allows you to pretend you’re efficient or powerful when you would rather be in your pyjamas in front of the TV. Wear jeans and a T-shirt to the office to pretend to your co-workers you are laid-back when your personality tends towards the uptight. It’s hard to admit to pretending because in Western society no one likes a faker. Great store is placed on ‘keeping it real’. We tell those with unrealistic expectations to ‘get real’, ‘face reality’ or ‘wake up and smell the coffee’, as if the rest of their activities were a dream. decided to turn the word “pretentious” into a compliment. The common assumption is that there are “real” people and there are others who are pretending to be something they’re not. There is also an assumption that there’s something morally wrong with pretending. My assumptions about culture as a place where you can take psychological risks without incurring physical penalties make me think that pretending is the most important thing we do. It’s the way we make our thought experiments, find out what it would be like to be otherwise. If ‘pretending is the most important thing we do’ then what bred such discomfort with it? What is pretentiousness? Why do we despise it? And more controversially: why is it vital to a thriving culture? In this brilliant, passionate essay, Dan Fox argues that it has always been an essential mechanism of the arts, from the most wildly successful pop music and fashion through to the most recondite avenues of literature and the visual arts. 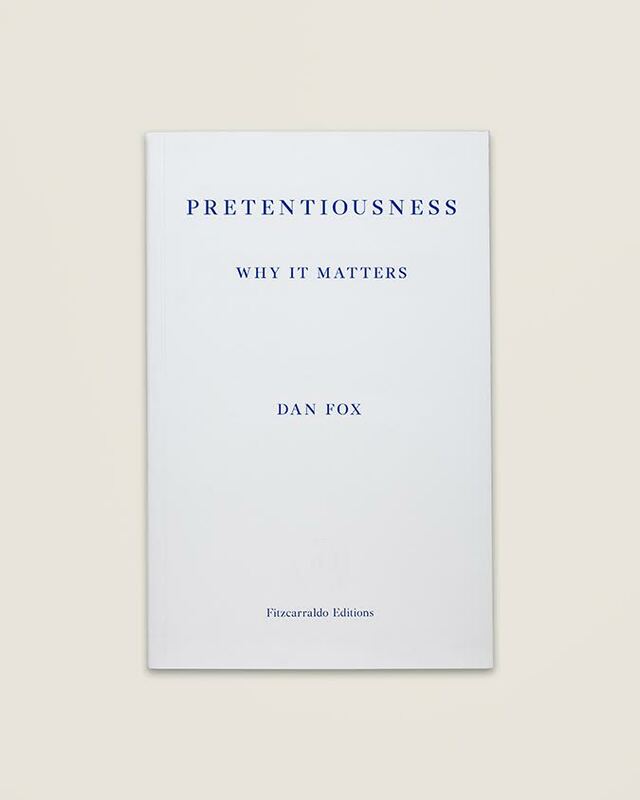 Pretentiousness: Why it Matters unpacks the uses and abuses of the term, tracing its connections to theatre, politics and class. From method acting to vogueing balls in Harlem, from Brian Eno to normcore, Fox draws on a wide range of references in advocating critical imagination and open-mindedness over knee-jerk accusations of elitism or simple fear of the new and the different. Drawing on his own experiences growing up and working at the more radical edges of the arts, this book is a timely defence of pretentiousness as a necessity for innovation and diversity in our culture.